When you look at the whole world, you see a blend of these two trends — the population of the globe is aging, on average, but there are still far more children than old people. David Attenborough is reported in the Guardian as being rather pessimistic about the future of humans. Much of what he is reported to have said is perfectly sound but many of the conclusions then present a pessimistic and apocryphal – a very Guardianesque – view. In fact I suspect that the spin is entirely due to the Guardian’s reporter and the Guardian’s remarkable ability to see a looming catastrophe in every advance. That with falling fertility rates, world population will continue to rise at a decreasing rate and stabilise by 2100 is just a matter of arithmetic. But a 100 years from now we will face the challenges of a slowly declining population. That natural selection is “defeated” when even weak individuals are cared for and are not allowed to die is not something to regret. We are in the process of artificial selection over-riding natural selection and at a quite different pace, but it is just another challenge for humans – not something to wring our hands over. In fact we are already practicing a sort of eugenics by default. The broadcaster and naturalist, who earlier this year described humans as “a plague on Earth”, also said he believed humans have stopped evolving physically and genetically because of birth control and abortion, but that cultural evolution is proceeding “with extraordinary swiftness”. “We stopped natural selection as soon as we started being able to rear 90-95% of our babies that are born. We are the only species to have put a halt to natural selection, of its own free will, as it were,” he tells this week’s Radio Times. Attenborough said he was not optimistic about the future and “things are going to get worse”. “I don’t think we are going to become extinct. We’re very clever and extremely resourceful – and we will find ways of preserving ourselves, of that I’m sure. But whether our lives will be as rich as they are now is another question. … he also appeared to express qualified support for the one-child policy in China. “Worse” is a matter of judgement. We will feed and house more people than ever before. We will take care of more of the elderly than ever before. We will each have more and affordable energy available to us than ever before. We will educate and empower more people than ever before. More of us will see more of this world than ever before. We will face more challenges than ever before. That’s not “worse”. 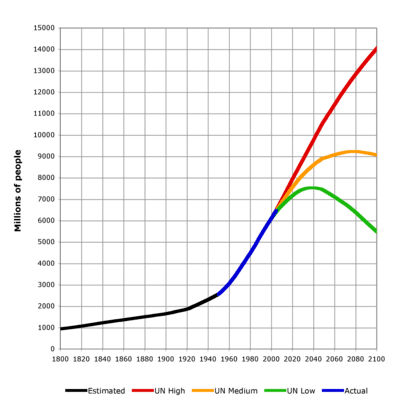 A new study shows that alarmist, Malthusian, doomsday scenarios regarding feeding the world’s population which may reach 9 billion in 2050 are not justified. A team of researchers from Canada, the U.S., Sweden and Germany has concluded from modelling results that it is feasible to double the world’s food production while reducing the environmental impacts of agriculture. Their findings were recently published in the journal Nature. By combining information gathered from crop records and satellite images from around the world, they have been able to create new models of agricultural systems and their environmental impacts that are truly global in scope. …. Improving agricultural yields. Many farming regions in Africa, Latin America and Eastern Europe are not living up to their potential for producing crops — something known as “yield gaps.” Improved use of existing crop varieties, better management and improved genetics could increase current food production nearly by 60 per cent. But I am no Malthusian and have a strong belief that the catastrophe theories are fundamentally misguided. Peak gas will never happen. Peak oil is a long way away and will be mitigated by new ways of creating oil substitutes as oil price increases. All the dismal forecasts of food production not being able to cope with population have not transpired. …..
…… Clearly it is possible at least for a while to escape the fate forecast by Robert Malthus, the pessimistic mathematical cleric, in 1798. We’ve been proving Malthus wrong for more than 200 years. And now the population explosion is fading. Fertility rates are falling all over the world: in Bangladesh down from 6.8 children per woman in 1955 to 2.7 today; China – 5.6 to 1.7; Iran – 7 to 1.7; Nigeria – 6.5 to 5.2; Brazil 6.1 to 1.8; Yemen – 8.3 to 5.1. Already huge swaths of the world are being released from farming and reforested. New England is now 80 per cent woodland, where it was once 70 per cent farm land. Italy and England have more woodland than for many centuries. Moose, coyotes, beavers and bears are back in places where they have not been for centuries. France has a wolf problem; Scotland a deer problem. It is the poor countries, not the affluent ones, that are losing forest. Haiti, with its near total dependence on renewable power (wood), is 98-percent deforested and counting. Sometime soon the world’s population will exceed 7 billion. No one knows exactly when. According to the UN Population Reference Bureau, this will happen on 31st October in India or in China. The world’s 6 billionth living person was “suppposedly” born just 11 years ago in Bosnia, and world population is expected to reach 9 billion by 2050. The billion mark was reached only after 1800. As many as a billion have been added in the eleven years of the 21st century alone, and predictions on future population growth are now treated with the same caution and scepticism as long-range weather forecasts. David Bloom of the Harvard School of Public Health says that the multitude of unpredictable factors means that taking a global view is problematic. ‘Among them are infectious diseases, war, scientific progress, political change and our capacity for global cooperation,’ he says. The general expectation is, however, that population growth will tail off, with UN predictions for 2050 ranging from 8.0 to 10.5 billion. The annual rate of increase seems to have peaked around 1988 and is decreasing slowly. The UN medium scenario seems to be close to the actual development. 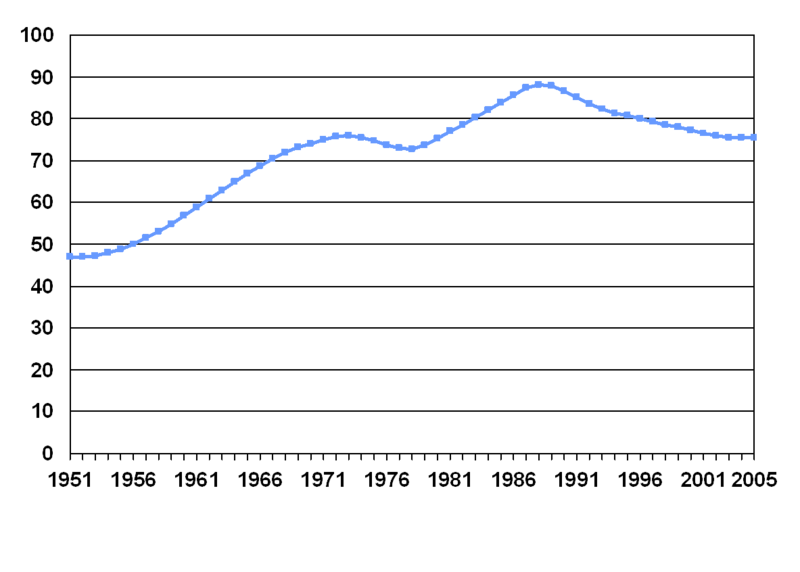 Annual increase of world population: Source United Nations, World Population Prospects: The 2004 Revision, 2005. But I am no Malthusian and have a strong belief that the catastrophe theories are fundamentally misguided. Peak gas will never happen. Peak oil is a long way away and will be mitigated by new ways of creating oil substitutes as oil price increases. All the dismal forecasts of food production not being able to cope with population have not transpired. In my own lifetime I have only seen human ingenuity increase. Every doomsday scenario has had to give way before human ingenuity responding to human needs. I also believe that our children and our grandchildren will be considerably “smarter” than we are and will have (or will develop) technologies and tools that we cannot even dream of. I am not very convinced or impressed by those who would ban things today “for the sake of our children and our grandchildren”. Even by the wildest stretch of his imagination my grandfather – who died around 1918 – would not have been able to imagine the technologies available today. Even my father – an engineer – who died in 1988 would not have been able to forecast the technologies we have at our command today. With the definition below I would have no problem to be labelled a cornucopian. A cornucopian is a futurist who believes that continued progress and provision of material items for mankind can be met by similarly continued advances in technology, and the abundance of matter and energy in space would appear to give humanity almost unlimited room for growth. Malthus’ ideas haven’t quite been discredited but his alarmism certainly has. As world population increases from the current 6 billion and approaches around 9 to 10 billion by 2100 studies suggest that population growth can have economic and environmental benefits. In 1937, A bureaucrat serving in the British Empire’s Kenya Colony penned an alarming memo to his bosses about conditions in the Machakos Reserve, a hilly, drought-prone farming region 50 kilo meters south of Nairobi. “Benevolent British rule” had encouraged the explosive “multiplication” of the “natives,” he reported, leading to massive environmental degradation. “Every phase of misuse of land is vividly and poignantly displayed in this Reserve, the inhabitants of which are rapidly drifting to a state of hopeless and miserable poverty and their land to a parching desert of rocks, stones and sand.” The apocalyptic warning came as the region’s population approached 250,000. Today, more than 1.5 million people call Machakos home. Rather than a cautionary example of the perils of overpopulation, however, for some experts Machakos has become a symbol of something very different: the idea that rapid human population growth, even in some of Earth’s driest, most challenging environments, is not necessarily a recipe for disaster—and can even bring benefits. They argue that, over the past 75 years, population growth in Machakos and nearby Nairobi has triggered social and economic shifts that have made it possible for residents to regreen once-barren hillsides, reinvigorate failing soils, reduce birth rates, and increase crop production and incomes. “A landscape that was once declared good for nothing is now like a garden when the rain falls,” says Michael Mortimore, a geographer with Drylands Research, a United Kingdom–based nonprofit organization, who helped document the turnaround in More People, Less Erosion, a 1994 study that is still influential—and controversial—today. “Too many people still have the simplistic notion that too many people is a problem,” he says. “What happened in Machakos challenges that pessimism.”…..
……. Many see crisis looming in those numbers for people and the environment. Others, however, see some hope for a transition to more sustainable livelihoods and cite Ester Boserup, a Danish economist who died in 1999, as one source of their optimism. In 1965, the then-little-known Boserup, who spent most of her career consulting for international development institutions, published a slim volume titled The Conditions of Agricultural Growth: The Economics of Agrarian Change under Population Pressure. (pdf Boserup1965) It examined the history of subsistence farming and offered a theory that essentially turned Malthus upside down. Instead of rising population density leading to barren fields and starvation, Boserup suggested it could naturally trigger “intensification”: the use of new technologies and more labor to get bigger harvests from less land. “The idea was that people weren’t just mouths to feed but also brains that could think and hands and legs that could work very hard”. ….. In some parts of Africa, meanwhile, researchers are documenting a notable, Machakos-like “regreening” of arid areas with fast-growing populations. …. There’s some evidence that the extra greenery is helping to make poor farm communities more resilient to droughts and economic setbacks, but the long-term outlook remains at best unclear. In the forest frontiers of South and Central America, researchers have found both Malthusian and Boserupian forces at work in deforestation. Depending on local circumstances, families faced with growing population densities have responded by both migrating to clear new farms in forested areas, the agricultural “extensification” predicted by Malthus, and intensified land use à la Boserup, a team led by David Carr of the University of California, Santa Barbara, reported in a 2009 study in Population and Development. Paradoxically, the result is that areas with relatively low population densities can have much higher deforestation rates than those with higher densities.